One way to monetize your blog is to place adverts on your blog posts. There are many affiliate programs available on the internet to choose from. One of the most famous one is the Amazon affiliate program. The scope of this blog post is to explain how to add Amazon ad Code to your WordPress blog post. First you should be subscribed to the Amazon Affiliate Program. To register with the Amazon Affiliate Program is really straight forward and it is out of the scope of this blog post. Once you have an account, you can proceed to choose the product and embed it to your blog post. Login to the Amazon Affiliate Program and search for a product by entering a search term or specifically the product name. Else navigate to the ‘Links & Banners’ drop down menu and select ‘Product Link’ if you want to sell a product. Enter the search term of the product you are looking for. Once you find such a product, click on the ‘Get Link’ button and you are presented with the link below. WP White Security.com Marketing Tip: Always tick the option ‘Open link in new window’ so users do not navigate away from your website. If you opt to add a Text Only Amazon add, all you need to do is to copy the link and paste it in the HTML editor of WordPress as seen below. After choosing the right advert options that fit your blog post, such as image size, link colours etc, it is time to place your advert on your blog post. 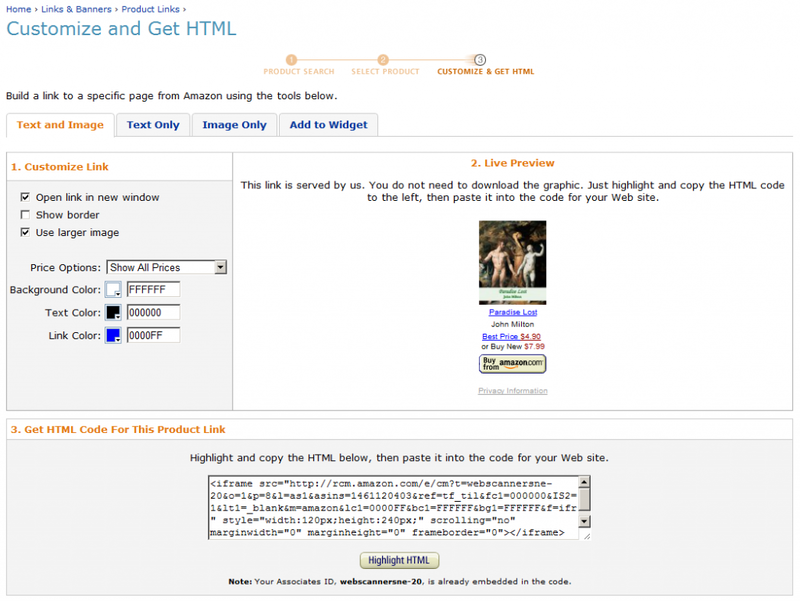 Similar to the Text Only Amazon Ad Code, you have to switch to the HTML editor in WordPress to place the code. You can use the code below in the HTML editor to place the code. Using the HTML code above gives you the flexibility to be able to set the justification for your Amazon advert in the WordPress blog post and also to add space around the advert as explained in detail further below. 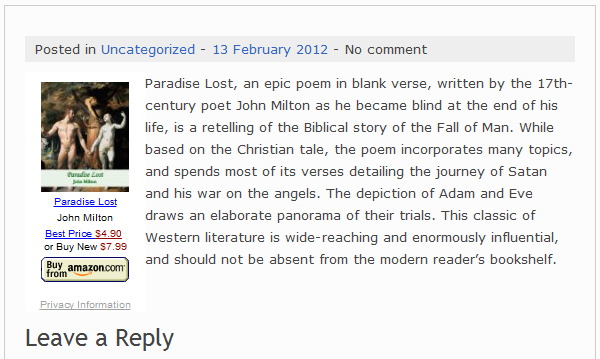 Using the above code, the advert will appear in the blog post as shown in the below screen shot. The HTML attribute code aligh=”left” (highlighted in the below sample HTML snippet) is used to left justify the advert in the blog post. Change the value to right to have the advert right justified and center to have the advert with centred justification. You can also increase the value in the cellspacing to increase the spacing between the advert and the text around it. To do so, increase the value of the cellspacing HTML attribute (highlighted below). WP White Security.com Marketing tip: Do not flood your website with adverts and make it clear which is advertising content and which is the website content. Website visitors do not like to be fooled, and no one likes websites flooded with adverts. Can you please help? Many thanks! Yes it should also apply to wordpress.com. Give it a shot and let us know 🙂 Good luck. I was so happy to find this post, but this didn’t work for me. I’m trying to use the text and image from Amazon, but all that showed up in my post was two gray lines….Any tips for how to fix it? It sounds like I have the same issue as Judy above. I own my blog, so I should have full right I would assume. Thank you for your comments. Even though you own the blog, it does not necessarily mean you are using a user with administrative rights. If you host your own WordPress rather than having a blog with wordpress.com check that you can see the plugins and the WordPress settings page to confirm that you are the blog administrator. Let’s start from there. If you are and it is still not working, the best solution is to contact us and we will assist you. It is quite difficult to find out what is wrong unless we get our hands dirty. All the best with finding a solution. This works for the image only but NOT when I try to add the image with text. It should work. Drop us an email on support@wpwhitesecurity.com and we will help you sort it out. I know this post is 3 years old but this really fixed my problem of my text and image links not showing up! Thanks so much!